Sir Frederick William Herschel is, quite rightly, famed as a great astronomer. In particular his observation that one celestial body was not a star, but the planet we know as Uranus, made him famous overnight. Though he acknowledged her in this discovery, the achievements of his sister Caroline are less well known and deserve greater recognition. As a result of contracting typhus when she was a child Caroline’s growth was stunted (she was only just over 4 foot tall) and it was felt, by her mother, that she should be trained for housework and light duties. Her father, however, encouraged her to join lessons with her brother. When their father died, William, then making a living as a musician in Bath, suggested that Caroline join him and take on the responsibilities of running his household- and maybe train as a singer to perform in some of his concerts. At this time William became increasingly interested in astronomy and while Caroline herself said, “I did nothing for my brother but what a well-trained puppy dog would have done, that is to say, I did what he commanded me.” it is clear from her letters that she became just as interested in astronomy as William. Indeed Caroline became a significant astronomer in her own right. When William became Astronomer to George III he perfected the telescope making which allowed him, and Caroline, to make their detailed observations and scientific discoveries. It is said that Caroline was his constant assistant in his observations, which is true, but it was Caroline who performed the laborious calculations that resulted from these observations and on which the discoveries were based. In 1787, King George III officially employed her as William’s assistant, providing her with a modest salary (£50 pa, roughly equivalent to £5,500 today), thereby making her the first woman to be paid for scientific services. Caroline, however, made many observations of her own. 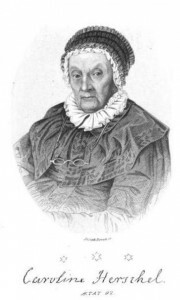 She discovered 14 new nebulae and in 1786 when she discovered her first comet, she became the first woman to do so. Her comet came to be known as the “first lady’s comet”. She went on to discover seven more comets. By 1797 William and Caroline had come to realise that there were a great many discrepancies between their observations of the night sky and the star catalogue published by John Flamsteed. Caroline devoted herself to the pain staking work of comparing their observations to those of Flamsteed. In 1798, as a result of Caroline’s work, the Catalogue of Stars was published by the Royal Society. It contained an index of every observation of every star made by Flamsteed, a list of errata, and a list of more than 560 stars that had not been included in his original catalogue! In 1828 Herschel was awarded a gold medal from the Astronomical Society of London. This was for her work producing a catalogue of nebulae. No woman would be awarded it again until Vera Rubin in 1996.